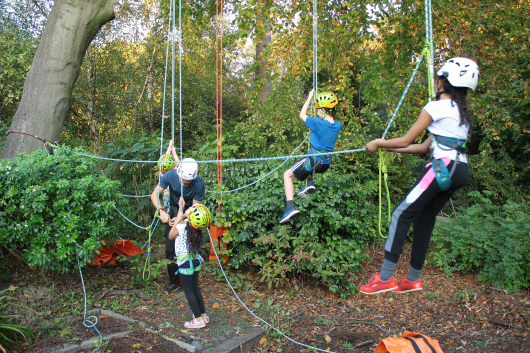 Discover Tree Climbing is a new organisation offering recreational tree climbing across England and Wales. Recreational tree climbing is a safe and thrilling experience, in which anyone from age 6 upwards uses a simple, yet challenging technique to climb into the canopy of tall trees. Tree climbing is a fast-growing sport and hobby in the UK. A maximum of 8 climbers can ascend at a time. Sessions last for 30 minutes to 90 minutes according to your preferences. We recommend a time of 45 minutes. The Double Rope Technique is a safe method used by arborists and tree climbers the world over. Climbers wear a harness and are attached to a climbing line which is secured to a strong branch. Using a system of friction knots, the climber uses the power in their legs to propel themselves up the rope, and into the tree. For prices please visit the website below or call 07917 684 165.